Supported Scaffolding Safety in Construction Environments Construction Safety Kit assists facilities of all types in complying with OSHA's Scaffolding regulation (29 CFR 1926.451), and helps employees understand the dangers of working with scaffolds, and how these risks can be minimized by knowing the correct ways to erect, maintain and use scaffolding equipment. Whenever a worker leaves the ground, the risk of an accident occurring increases dramatically. With more than 10,000 scaffold related injuries reported each year, OSHA has mandated that workers be trained on how to safely erect and use these work platforms. 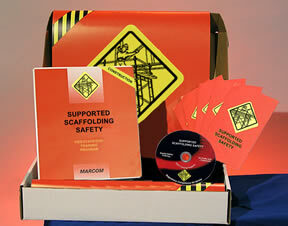 This kit will help employers meet the training requirements of OSHA's Scaffolding regulation. Materials in the kit include a DVD program, five motivational posters, and 30 employee booklets. The posters in the kit emphasize the importance of scaffolding safety. The DVD program and employee booklets include information on responsibilities of a scaffold expert, creating a level and stable foundation, platforms and planking, the danger of power lines, ramps and walkways, platform hazards, personal fall arrest systems, guarding against falling objects, and more. The DVD program in the kit comes with a comprehensive leader's guide, reproducible scheduling & attendance form, employee quiz, training log and training certificate.